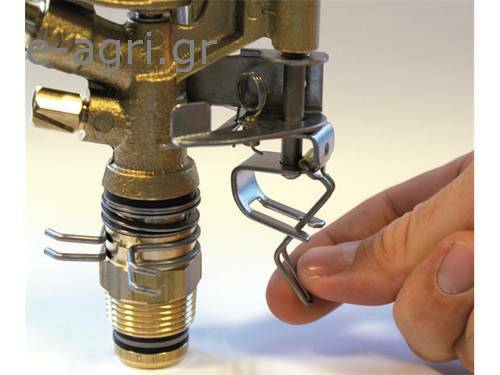 Metalic Sprinkler part-circle 3/4"IRO-60 with 2 brass nozzle. • male or female connection of 3/4 ". • Made of brass and stainless steel. • rotating joints high strength. • Angles of nozzles 24 and 12. • Mechanical system using clips easily and quick to adjust. • Used in irrigation coverage with average flows to cover frames andside coverage corners. • Great mechanical and hydraulic design provides important energysavings and optimum coverage ratio in its cast. • Range: 12 to 19 m.
• Flow: 800 to 3.270 l / h.
• Sector: Sector or circulate. • Nozzles: One main long range and over short-range secondary baffle. • Trajectory angles: 24 ° and 12 °. 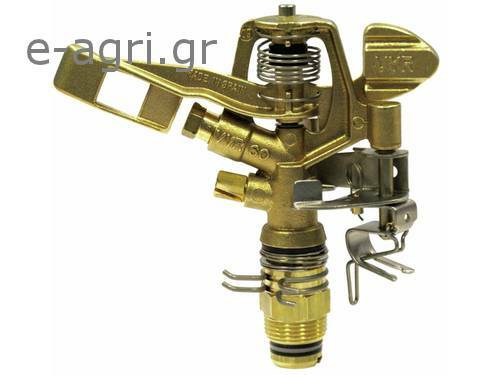 • Maximum stream height: 2.5 m.
• Rotation time: Depending on the pressure and nozzle is constant andcontinuous. • Horticultural plantations, cereals, tubers, legumes, and fruit.